Ravinder Reddy was born in Andhra Pradesh, 1956. He did his BFA and MFA in sculpture from M.S. University, Baroda, in 1975-82. Received a Diploma in Sculpture from the Goldsmith College of Art, 1983 and also pursued a course in Ceramics from the Royal college of Art, London in 1984. 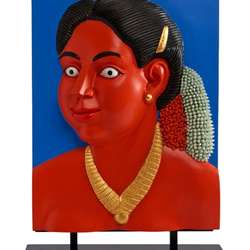 Reddy s monumental female heads and nudes are among the most visible and recognizable examples of contemporary South Asian Art. 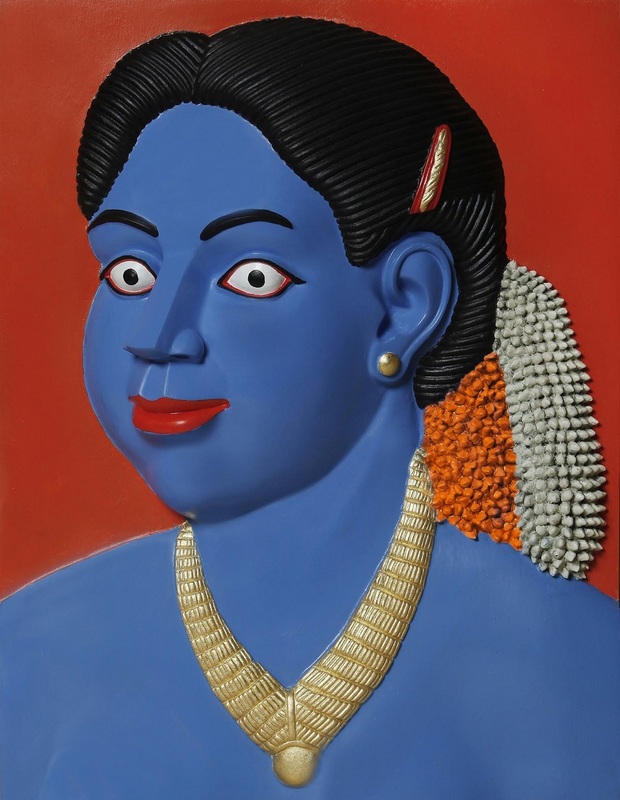 Reddy fuses pop and folk sensibilities with the traditions of Hindu sculpture. His works suggest a multifaceted femininity that is at once rooted in the past whilst embracing the contemporary world. 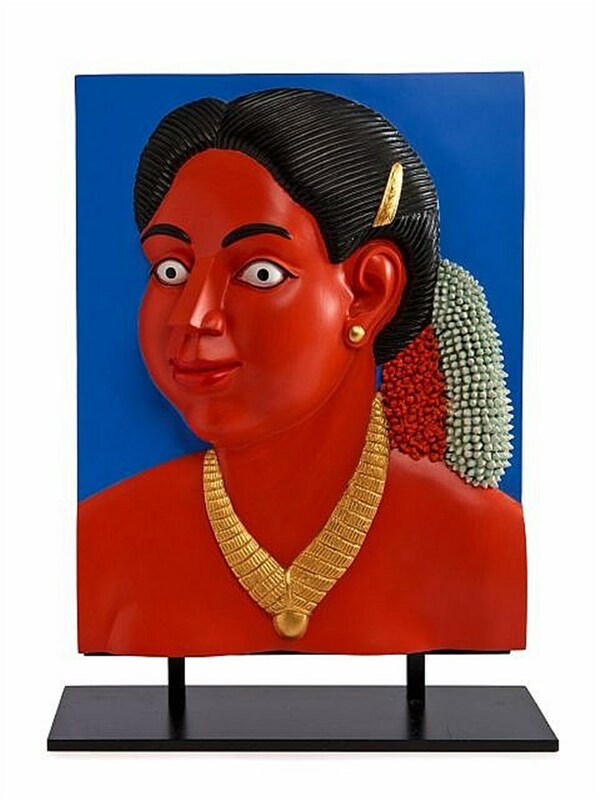 Decorated with brightly coloured thick red car paint and gold gilt, Reddy s sculptures appear to be kitsch personified. Their wide open eyes, bold, rhythmic silhouette, elaborate hair styles, lipstick smeared pursed lips, coiled hair with plastic bands and ribbons stage the relations between memory, history, mythology and contemporary reality, the ironies of modern societies. However, their grand, confrontational stance and unblinking stare prevents them from becoming a comic spectacle. They would be neither out of place in a modern bazaar nor in an Indian temple. These female figures are dispassionate and impersonal, however there is a kind of alertness in their expression. His references come from varied sources such as ancient Indian, Egyptian, African sculptures and even the contemporary works of Niki de Saint Phalle, Fernando Botero, Luis Jimenez and Jeff Koons. He was one of the first contemporary Indian artists to draw critical attention in America following his show at Deitch Projects in 2001. He appears in collections such as that of the Victoria & Albert Museum, London; Peabody Essex Museum, Massachusetts, USA; Fukuoka Asian Art Museum, Japan; Frank Cohen Collection, UK;ã€€Virginia Museum of Fine Arts, Richmond, USA; and the Queensland Art Gallery, Brisbane, Australia; in addition to attracting attention at various international contemporary art auctions. 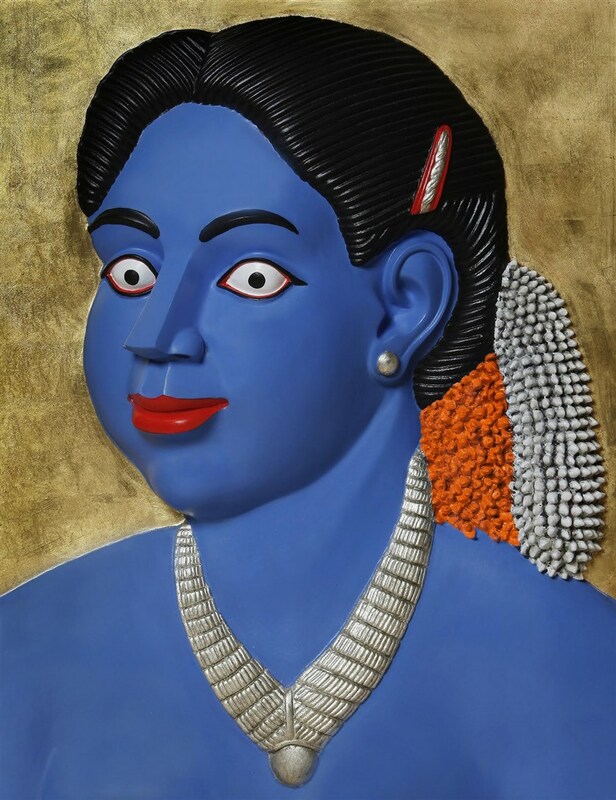 Ravinder Reddy fuses traditional Hindu art and contemporary pop. Reddy uses this fusion as reflective of the contemporary women borrow modernity and traditional sense for a newer effeminate style. Essentially working with sculptures, the oversized bulge and kitschy colours define the popularity of his works. He plays with a humor and a sense of exaggeration in his works.